Of course, the nocturnal sig-tor threat didn't materialize. But, tornadoes occurred nonetheless, including a tornado that moved through Norman, OK just after I departed for southwestern Oklahoma. I had to work a fire weather shift on this day, but was able to leave work early. I traveled west on I-40 initially, just in case convection surged north with any intensification in the LLJS. As it turned out, a supercell in southwestern OK made very little east-northeastward progress during my drive. As I drove south on highway 54, this storm came into view, and it was quite apparent that it was an HP. This tornado dissipated fairly quickly. I then followed the storm northeast. The sun set, and the LLJS was definitely cranking up. I eventually navigated through the RFD and repositioned myself along the edge of the updraft. Initially, the occluded portion of the updraft to my northwest looked favorable for another tornado. But that area got a cold look, and a new meso formed to my north-northeast. 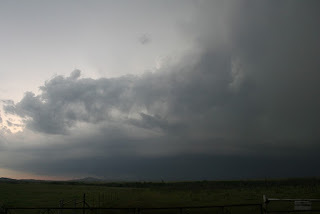 A v-shaped lowering developed, back-lit by lightning, and a brief 20-second tornado occurred. I don't have the exact time of this event, but apparently it touched down close to the town of Carnegie, OK. In addition to this tornado, it was eerily cool listening to the inflow scream through the powerlines positioned along the side of the road. I then decided one nocturnal tornado was enough for me and ended the chase. However, the battle back home through pouring rain was hell, but I eventually made it back to Norman shortly after 11pm, and celebrated a successful chase by having a couple of beers with a few friends.